farmer fun 168. Farmers Day Out!! "You are fit to be a farmer!" this is what my Mom used to say when I flunked in my exams or didn't studied.But I sometimes used to think and even ponder on these lines.Why can't I be a farmer?.As of now my forefathers were sowing rice and Wheat in TN and SriLanka few decades ago and I could do the same.I soon realized the importance of being a farmer.Wow! farming is fun for people who are really interested to explore this art.Yes my dear readers farming is an art.It is the primary occupation of people in our nation.Ages ago I had learned during my school days that around 71% of people in India are directly or indirectly depended on agriculture.Even urban population depends on agriculture. I mean the food that we obtain is something which is due to the hardworks of farmers.I can see my readers yawning. I warn you guys as I am not responsible if you change your occupation after reading this post.Any way my last post was dated October 9 and its 28 today.I 'm back after 2 long weeks.Did you miss me? Hope SML post was useful and made sense .Any way lets start with the discussion for todays topic.Yes my dear bloggers, I am going to talk about one thing which is becoming the centre of attraction.FARMVILLE is becoming popular these days.It can be considered as one of the best application which Zynga has produced. Zynga has always suceeded in creating these kind of applications which can constantly trouble young souls.I can proudly or rather shamelessly say that more than one fourth of the world population is practicing virtual farming using Facebook.Shamelessly just because that I am wasting my precious time farming online.I am going to talk about online farming and few important things related to the same.Before doing that I would like to say few things about my beloved sister who is a popular farmer in facebook.But before introducing her to you I would like to name few popular bloggers in blogsville who have left their impression in farmville.They have been seriously following online farming like anything.To name few we have Americanising Desi,Nushu,Nabs,Shifoo,Anurag and many others.Esther is growing into a strong farmer day by day.She is currently farming at level 32.Freelancer is currently farming at level 28.But people here adore this application.Any way I have a surprise for few female farmers out here in blogworld.Well the guest for this post is none other than my beloved sister and a blogger friend Meow. Meow loves facebook and to be honest she loves farmville. We will go tete a tete with her sooner or later.When I joined facebook there was nothing really fascinating.It had some really insane quizzes(the insanity now has increased),poking features and status updates.I was pining for something like Mafia wars.I disliked Mafia wars initially when it was launched as I was finding it to be difficult and complicated.But since I was craving for it,I had to learn it step by step.Ohoo! I can hear snores and can predict that few of you are actually sleeping.Sorry for this.Farmville is a place where you can perform farming in a browser window using flash. 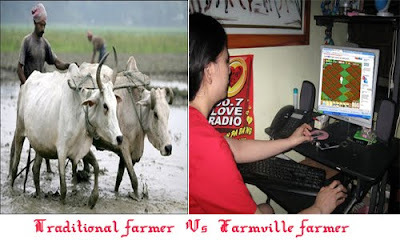 .Well let me tell you the advantages of farmville as compared to traditional farming. 1.There is no need for rain in farmville. 2.Crops can grow within hours in farmville which takes more time in real life. 4.You don't need to go to market and toil hard in sun.Money will get automatically added during harvesting. 5.No weather problems in farmville.In real farming different parameters like climatic conditions are considered for farming. 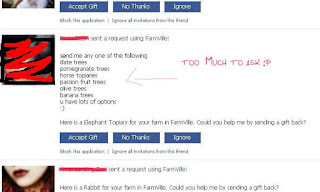 6.In farmville you can sow anything . 7.Soil quality is not a big constraint in case of farmville.In real world soil quality is different for different crops. A big advantage of farmville is that we could sit comfortably in our bed room and farm easily. So it is not at all something which is really sophisticated.I will post you few pictures of my sisters farm.Now I am going to talk about few irritating farmers. ABC: hey do you play farmville? ABC: then please add me as your neighbour dude. Well Meow shamelessly asked me to be her neighbour in farmville.It seems she wants to expand her farm and my intelligent sister found an innocent victim in from of Solli. .Well this is really annoying at times.Another annoying thing is about the gift requests. I am posting this picture just because I found it as a good example for this post.Infact I wouldn't get anything better than this.This is a girl who presents a list to me.She wants me to gift her those items.Everyone knows me as a lazy bum and imagine me gifting people.I had around 85 gift requests in farmville.I ignored all of them. .Here is the much awaited pics.Please don't even try to guess the hidden person. Farmville farmers would clear mess from others farm or shoo off crows or sparrows in others farm to earn bonus.It is also seen that some farmers have started harassing their loved ones to harvest crops in their absense by giving them their password .Silly!! is the first word which comes to my mind.People are getting addicted to this application or game to be precise.We have real men toiling hard under the sun and here we are wasting our precious time. Its a rumour that president Barack Obama is maintaining his own farm in Facebook.Infact he was caught sowing rice by one of his officials. 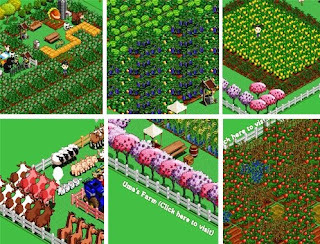 Even famous European leaders like Nicolas Sarcozy and others have decided to follow Obama's foot steps and they have created their own farm in Farmville. Well Meow will kill me after reading these lines as shez a real time fan of FV. so here we go one on one with Meow. Solli:Why do you prefer online farming? Meow:its so easy than real farming..crops will grow so fast... than in real farm where it takes so many months..moreover there is no need for rain here i need not commit suicide if there is no rain unlike real farmers do..
Solli:Now that was an insight to all Farmville farmers.Thank you Meow! Meow:Thanks and do check my farm pictures. 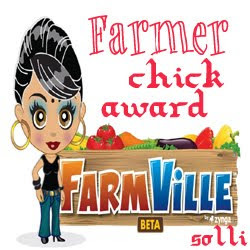 Here is the farmer chick award for the beautiful ladies.I proudly present the farmer chick award to Meow,Americanising Desi,Esther and all those female farmers who send me gift requests . I would like to thank my fellow blogger Miss Sarah Flinders for the "Creative Blogger" award that she presented me.Thanks a lot Sarah. So to conclude this post with a happy note I asked Taylor Swift to write a song for my post. nd harvest them day after tommorow. nd smile like a see..
Crap.... let me admit ..this poem is my creativity Forbid me Taylor.Between I am in with Taylor Swift .. Even she accepted my proposal ..believe it or not blaaah!!!! I am actually in a big mess right now.I am not being able to write or read anyones blog but I promise to be back Asap.Thanks a lot for taking your time and coming here.I you all. was nice to read..getin addicted to farming..sahi hai..:)nw enuff of online farming,better think abt offline as well..lolzz.. I SO VERY HATE FARMVILLE!!! lol:)...:)...lovely post and congrats to all:)...he he..
may you have many more..
lol! im bored of farmville already! nice blog u have here..
yes buddy...farm villa is interesting and funny. Now I earn more than 100000 coins a day.. I think you are my poor neighbor who has stopped farming after earning 1699 XP !!!! OMG! and is that nushu me??!!?!? I liked the new look of your blog..